MPLAB® Harmony provides the capability to quickly develop complex embedded systems that utilize multiple middleware stacks running at the same time in a Real-Time Operating System (RTOS) or non-RTOS system. The rapid prototyping ability of MPLAB Harmony is due to the availability of software modules: Drivers, System Services and Middleware Libraries; and tools: MPLAB® Harmony Configurator (MHC) and MPLAB® Harmony Graphics Composer (MHGC); that are designed to allow maximum reuse of code and rapid development. The following exercises demonstrate the quick prototyping capability of MPLAB Harmony. These exercises should be completed in a sequential manner in order to understand how the following exercise enhances and adds new functionality to the earlier exercise. Use the provided source files and step-by-step instructions for each lab. Just build the solution project (found in the lab's firmware folder) and download it to the MEB II board to observe the expected behavior. Create an MPLAB® X IDE Harmony project for a PIC32 microcontroller from scratch. Use (MHC) to configure and generate Harmony code. Create new application states and variables for Harmony projects. Identify the proper place to add your own application code to the Harmony project. Demonstrate the use of Harmony peripheral libraries and drivers to control PIC32 peripherals (SPI, I2C, Timers, etc.). Demonstrate the use of Harmony middleware libraries (USB, FS, and Graphics, etc.). Micro SD card containing audio files in waveform audio format (WAV). USB Type A male to micro-B male cable for SD card reader functionality. The associated ZIP file contains the completed solution of these five labs. The completed solution is not needed to develop the labs from scratch; it can be used as an example and requires no modifications. To gain a deeper understanding of how to use the MPLAB Harmony framework for Quick Audio Prototyping, and creating an SD card Audio Player/Reader, we recommend you follow the step-by-step procedures detailed in the "Procedure" section below. This ZIP file contains the completed solution projects for all labs associated with this SD card audio player tutorial. It also contains the source files needed to perform the labs per the following step-by-step instructions (see the "Procedure" section on this page). If this is not done, the MPLAB® X IDE will not be able to find all source files for the lab solutions (see project in the firmware folder); the solution projects will not build successfully. audio_player contains five lab folders (audio_player_labx, where x = 1 through 5). audio_player_labx contains the lab solutions (in the firmware folders) and source files (in the dev_files folders). dev_files contains application source files and other support files (if any) required to perform each lab (see "Procedure" section below). firmware contains the completed lab solution project. It can be directly built and downloaded on the hardware to observe expected behavior. Lab1: You should be able to hear a sine tone output through the headphone jack on the Multimedia Expansion Board II (MEB II). Lab2: As in Lab1, you should be able to hear a sine tone output through the headphone jack on the MEB II. Lab3: You should be able to load audio files to the SD card by connecting the MEB II to a PC over the USB interface. The MEB II will act as a USB Mass Storage Device. For Lab3, you will be able to play audio data saved in a tone.txt file by loading it through the USB interface. For subsequent labs, you will be able to play WAV files by loading them to the SD card using the USB interface. Lab4: You should be able to play, and hear audio tracks (WAV files) played on your headphones connected to the MEB II. Lab5: You should see a graphical user interface on the MEB II display, populated with a list of audio tracks (WAV files) read from the SD card, along with volume and mute control. The user interface should respond to touch events and you should be able to select random tracks for playback, adjust the volume level and mute/unmute the audio output. Problems with the results of each lab could occur if you don't carefully follow the detailed steps provided. Also, note that each lab is an extension of the previous lab; successful completion of earlier labs is essential for following labs to work. In this exercise series, we have successfully developed an audio solution right from the basic tone playback to an SD card audio player. We added graphics display support and also added support for an SD card reader. 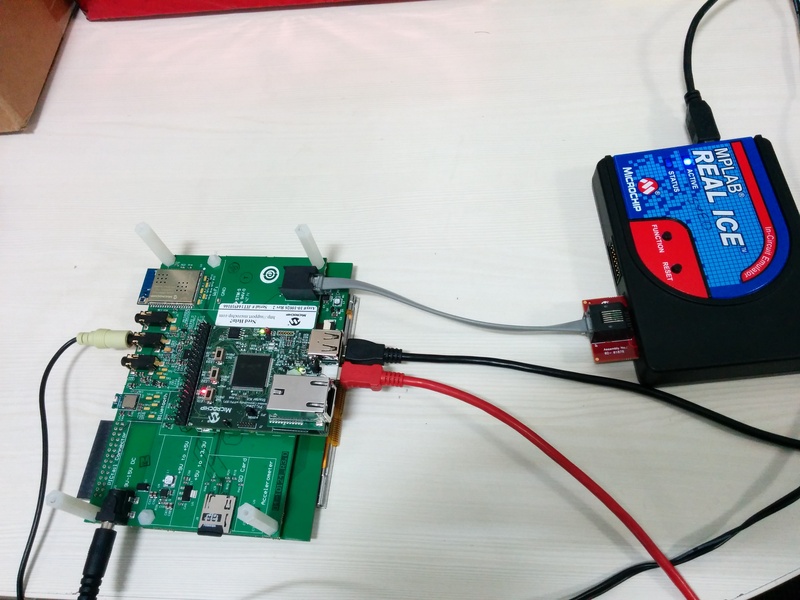 Using the MHC we configured the hardware modules including Clock, CODEC driver, Reference clock for the CODEC, I2S driver, SPI driver, SD card driver, GFX library and USB Library. Each of the lab applications was developed in a state-based, loosely coupled implementation. The state-based implementation and loose coupling enabled easily enhancing subsequent labs. By the end of this lab series, you will have successfully developed a fairly complex audio solution in a fairly short time. By now you should appreciate the real power of MPLAB Harmony, particularly the power of MHC and the ease with which it allows you to add/remove software modules to an existing developed application. With this lab series completed, you are now in the position of creating complex applications using PIC32 microcontrollers. MPLAB harmony provides all the necessary software tools which will enable you to quickly develop your application. If you want to expand on this exercise series try adding more software components such as the TCP/IP stack, or add application support for audio recording.